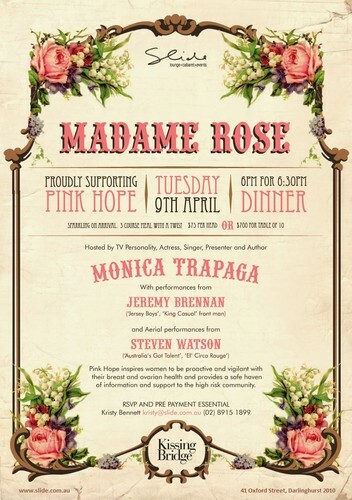 Welcome to Madame Rose, Slide's Quarterly female focused charity event. Gather together your girlfriends to enjoy sparkling wine on arrival, fine dining, stunning entertainment, personal stories from inspiring women and loads of treats and surprises all in support of Pink Hope. Tuesday 9 April - 6pm for 6:30pm Dinner. Sparkling on arrival. 3 course meal with a twist. Hosted by TV Personality, Actress, Singer, Presenter and Author: Monica Trapaga. With vocal performances from Jeremy Brennan (Jersey Boys, King Casual) and Aerial performances from Steven Watson (Australia's Got Talent, El' Circo Rouge). Pink Hope inspires women to be proactive and vigilant with their breast and ovarian health and provides a safe haven of information and support to the high risk community.